Break out your blender and get ready for a seriously satisfying meal that everyone will adore. 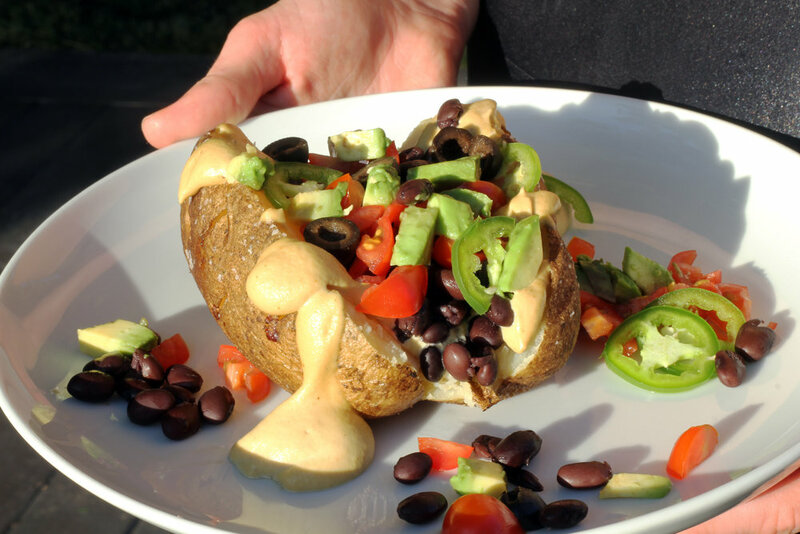 I LOVE a great baked potato and this one has that rich and creamy queso taste and feel. The “cheesy” flavor comes from nutritional yeast, which also adds protein, B vitamins and a cheesy golden hue. Preheat oven to 350°. Make sure the potatoes are dry. The drier the skin, the crispier the potato. Pierce potatoes all over with a fork. Rub with oil and season generously with salt and pepper and place on a foiled baking sheet. Bake until potatoes are crispy and easily pierced with a fork, 1 hour to 1 hour 30 minutes. Top with cheesy sauce and veggies of choice. Soak your cashews in hot water for 1 hour before starting this recipe. Drain and then proceed with recipe. If you have a Vitamix soaking may not be necessary. Preheat oven to medium broil and add jalapeños to a baking sheet. Broil on the top oven rack for about 10 minutes until slightly blackened. Carefully peel outside skin away and remove any stems. Add soaked, drained cashews and jalapeños to a blender along with nutritional yeast, water, chili powder, cumin, garlic powder, and salt. Blend, adding more water as needed to create a creamy, cheese sauce. Serve immediately. Store leftovers covered in the refrigerator up to 5 days. Reheat on the stovetop.